Fox Hunter Classic Skinning Knife And Sheath | BUDK.com - Knives & Swords At The Lowest Prices! 3 or more only $8.00 each! 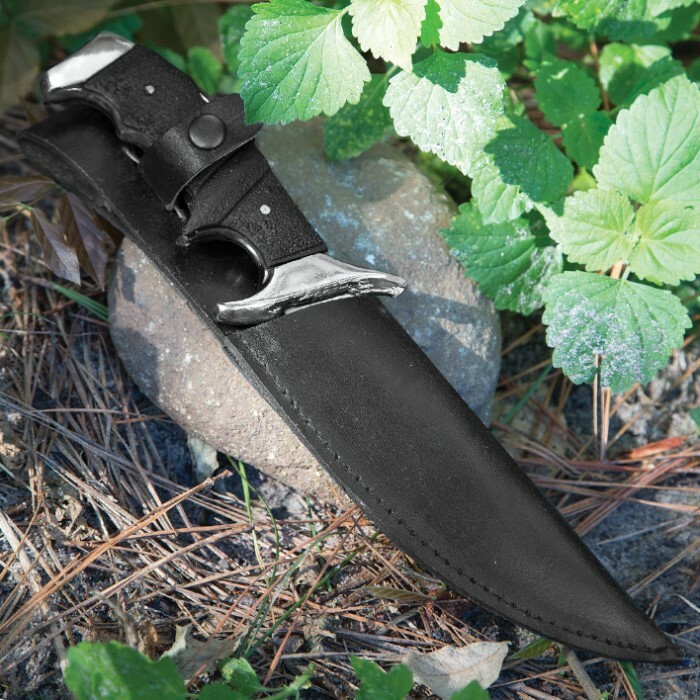 The Fox Hunter is a reliable, high-quality skinning knife that will meet the challenge! 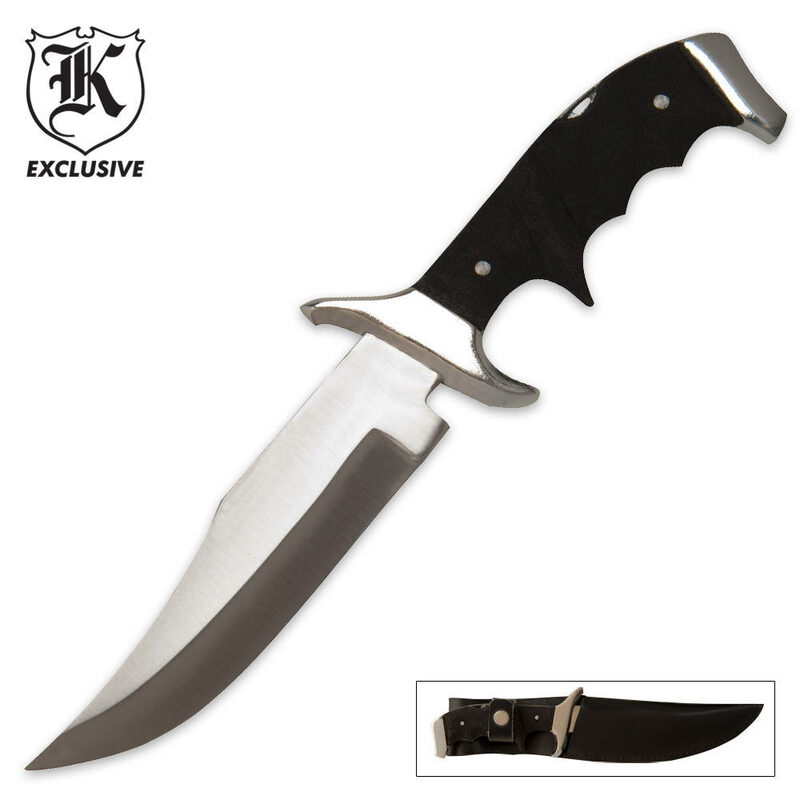 It has a 6" hollow ground stainless steel blade that was heat-forged and has a drop point. The custom, textured black handle gives you a slip-free grip. A top quality leather sheath is included to house the skinner knife. The Fox Hunter Classic Skinning knife is perfect for the hunter on your gift list! best knife I ever had. I never knew someone could cut so many corners on a knife. The sheath is basicilly paper, the blade is super thin, the handle is like rubber flooring and over laps over the handle. But for some reason i like this knife. ive had this knife for about a year and after working on it for hours it is finally in a working condition. the molded handle overlaps the blade in some areas which i fixed using a rat tail file. the two rivets holding the handle together crudely protrude through the rubber. i eventually wrapped the handle in electrical tape to keep the rubber pieces from falling off. the cast hand guard had pronounced manufacturing marks which i also fixed with a file. The sheath, though imitation leather, held up better than i expected, but this could be in part of me putting extra threading into the stitching holes along the length of the sheath. I also added a bottle opener just beneath the blade using a dremel tool. i like it as it sits now but it really is junk straight out of the box. I bought cheap knives made in countries that you will not be able to pronounce it properly. But, this knife says made in Pakistan and the quality cannot even compare to India. There is metal solder on blade, handle, and its a cast piece with handles that hurts when you hold it. It has two rivet like nail protruding at handle. The rubber handle is made by a mold that fits other knives and not this one. It is a waste of anyone's money. BudK should be ashamed to peddle this NO quality knife. I will go thru the trouble to return it because throwing it away is hazardous to society! i would have rated it lower but you have to pick at least one star. i've paid a dollar for better quality. duct tape would have made a better handle then the poorly molded uneven handle it has. It's an OK knife for light use as has been said, but the handle material leaves something to be desired. I ordered a second one because the first knife's handle material was very shoddy. Looked like someone had taken a knife and hacked at it. It was frayed and discolored. Second knife was better, but still not great. I bought this knife and had it for a few days. The reason I rated this a 2 is because it held at first but the first time I tried to use it, the blade broke clean off. It is not full tang and would not recommend. The blade on this knife is good which is why I buy knives mostly. But the sheath is cheap and the handle doesn't fit against the tang correctly. Needs a bit of modification such as sanding down the material used as the grip but a decent knife all together.